Summertime is about fresh vegetables, especially from the garden or farmers’ market. 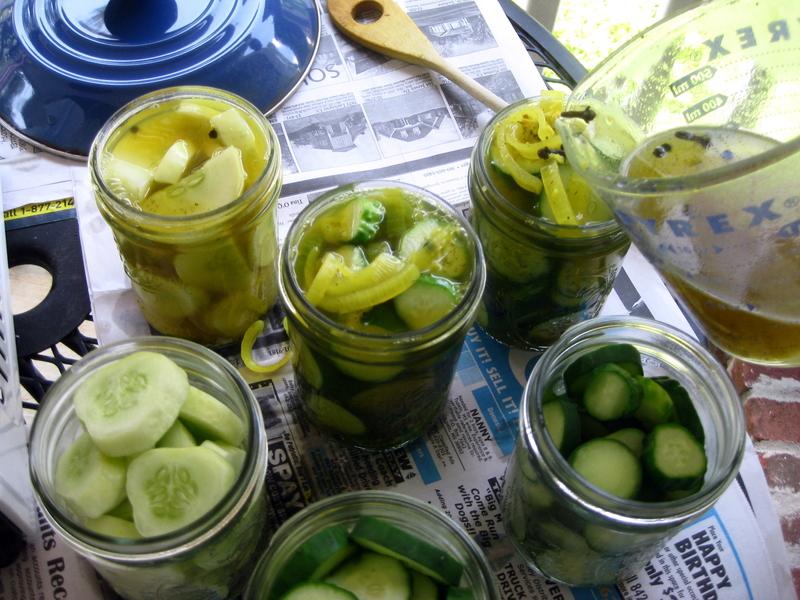 My daughter loves dill pickles and I love growing cucumbers in my little garden. 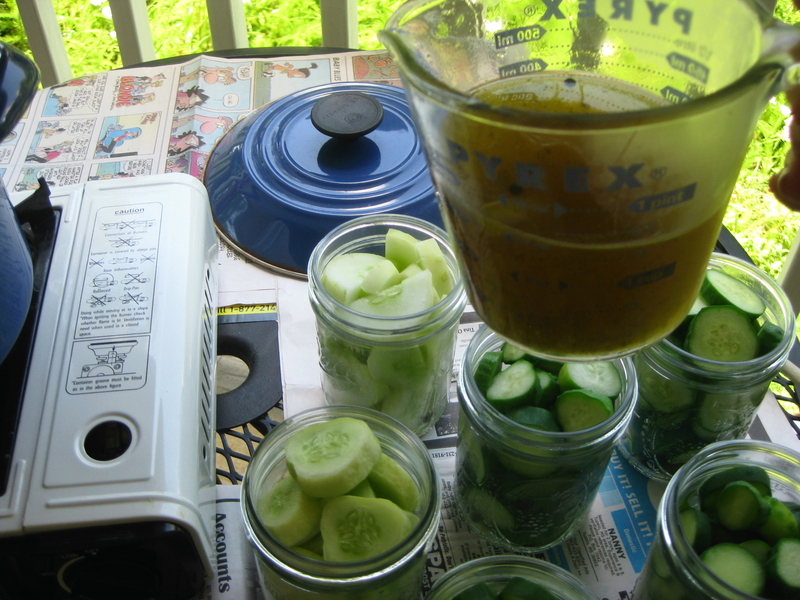 But for at least a couple of seasons, I couldn’t find a recipe with the right sour/garlic/dill balance that kept the cucumbers crisp. Finally, success! It’s easy and fun. 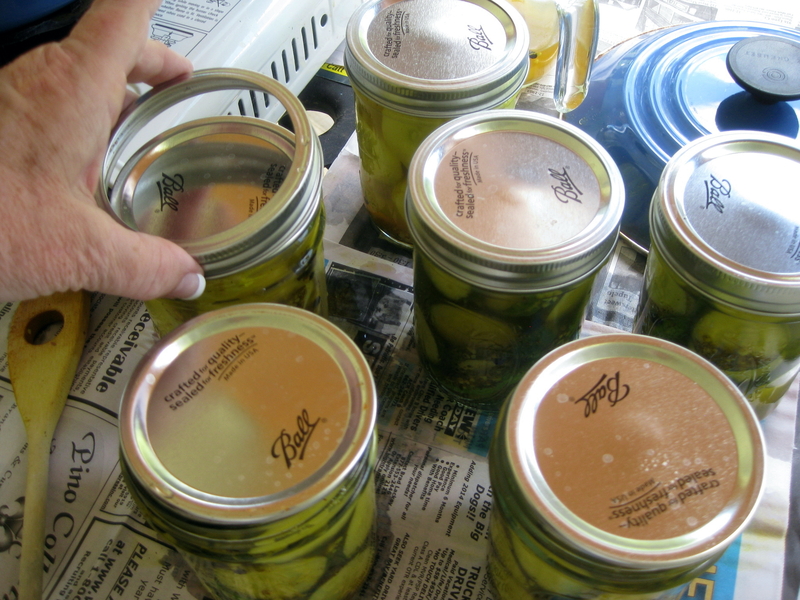 You also can pickle other veggies like carrots, green tomatoes, green onions, green beans, okra and asparagus. That’s certainly not the only list, so use your imagination. My experience, though, calls for a little extra par-boiling for tough veggies, like green beans and especially the okra to soften up the tough exteriors. 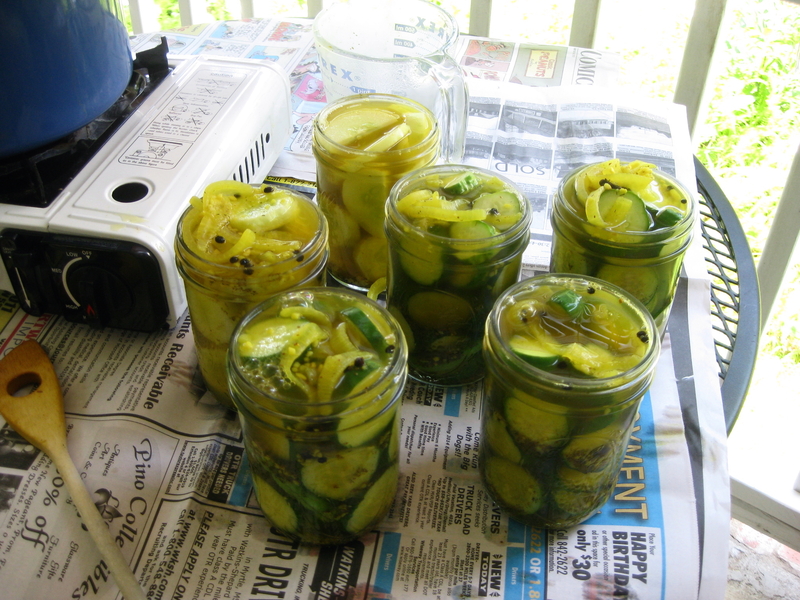 I highly recommend prepping in your kitchen, but taking the pickle process outside onto your patio or porch. Several years ago, I acquired a really neat one-burner, gas stove at the usual big-box store in the camping section. This burner is perfect for boiling up the pickle juice outside, otherwise your house will smell like pickles for a very long time – maybe years. No kidding. Usually, I double the pickle-juice recipe and then store what’s left over in the fridge until I need to heat it up again or add to another batch. Fill water to half-way in a medium size dutch oven or stock pot. Heat on high to boiling. Meanwhile, scrub cucumbers (and other veggies) under cold water. Set aside. 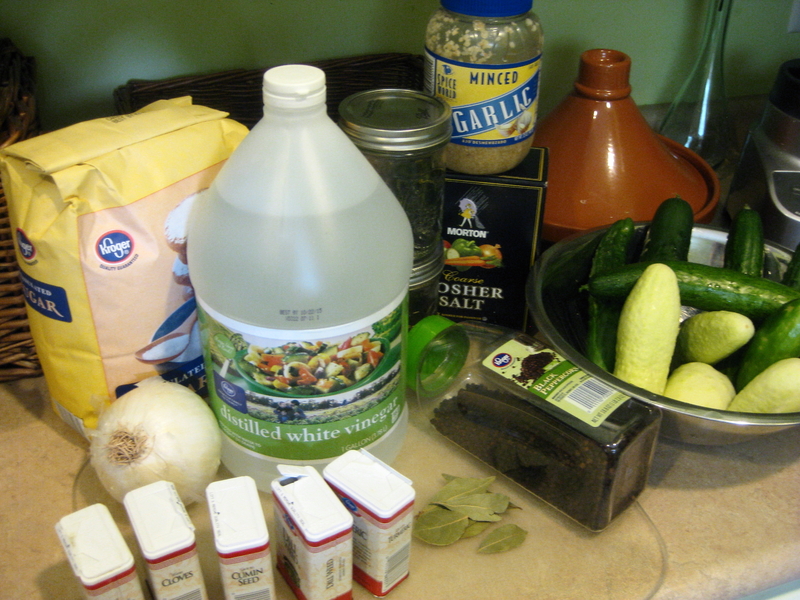 When the water’s boiling, place 2-3 cucumbers at a time into boiling water. Count to 10, remove them and immediately put them in the cold water in the sink to cool. Skip this stage with green tomatoes. 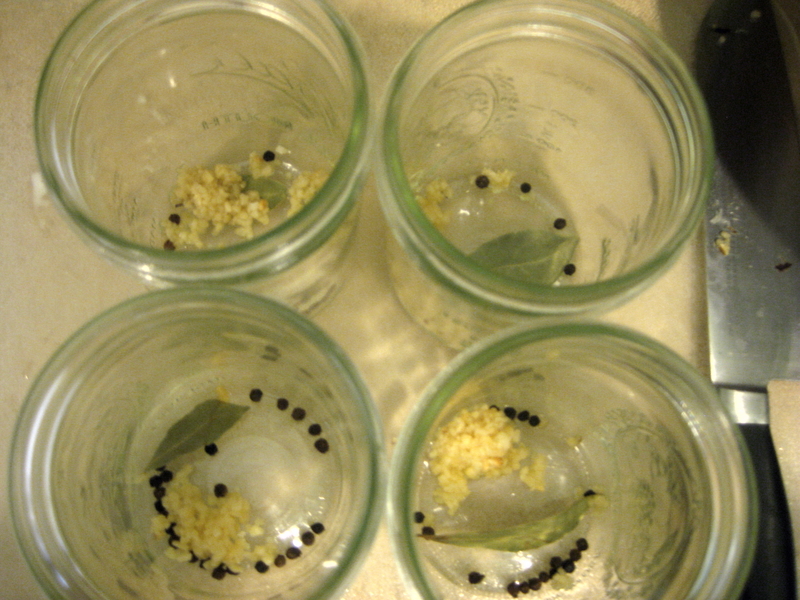 In your jars, drop a few peppercorns and 1/4 teaspoon minced garlic. Plus, you can add chopped celery, a few carrots and fresh dill sprigs if you want. On your cutting board, slice cucumbers. I like them about 1/4 inch but make them as you like them, thinner or thicker. Carrots can be pickled whole or sliced. Green tomatoes should be at least quartered. Cut okra in half. Then fill your jars. Press veggies inside to crowd the jars. 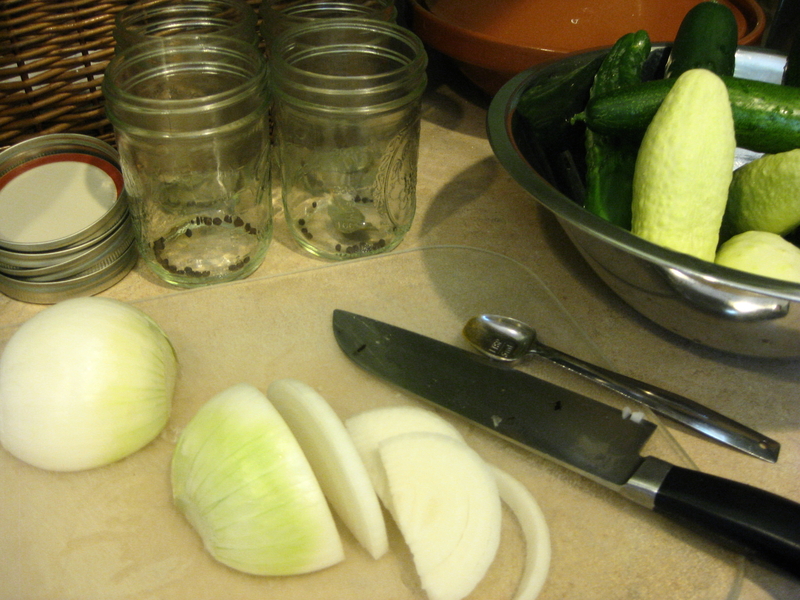 Inside, add all pickling ingredients into your tall soup pot, except vinegar. I arrange my outside cooking surface with old newspapers because I know I will purposefully over-fill the jars to ensure I haven’t left any air before sealing them. Take your pot outside, add the vinegar, stir, cover and heat until it boils. Reduce heat and simmer 5-7 minutes so your onions are nice and soft. This also allows the spices to incorporate into the juice. 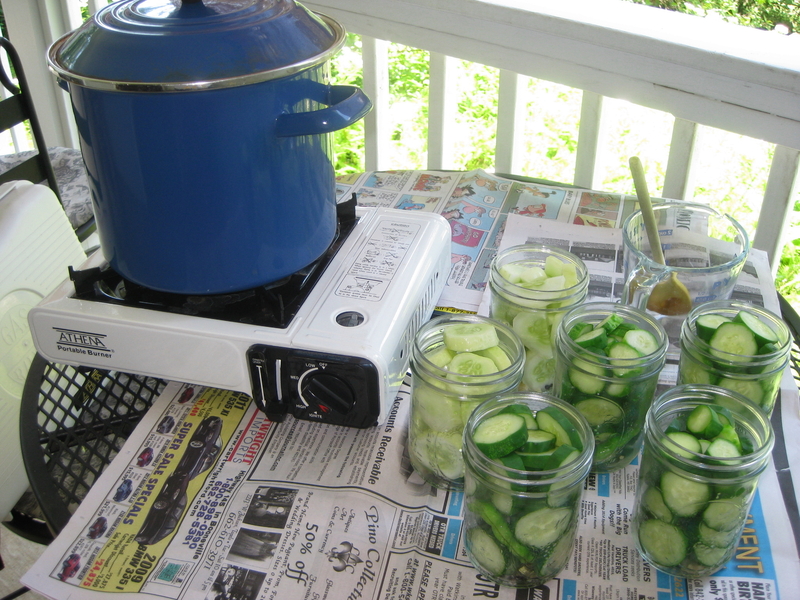 Carry your veggie-filled jars outside to your cooking surface. 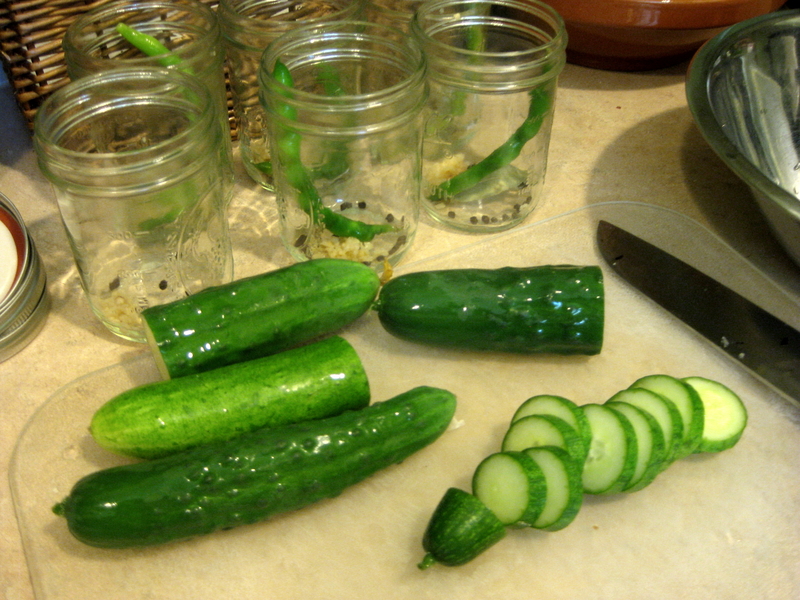 I use a 2-cup glass measuring cup to scoop pickling liquid and pour it into each veggie jar. After you’ve filled them all, come back and top them off. You’ll want to pour some of those onions and garlic into the jars too, if you can. Let the filled jars sit 5 minutes or so, to allow trapped air to work its way out. Add more liquid, if you need to. Then place seal-top on each and press down. Expect juice to roll out. That’s OK. Then take your screw-top rings and lightly screw on top of your seal-tops. Let your jars cool for at least 20 minutes and then check to see if any still have air. If so, fill a little more, then re-seal. 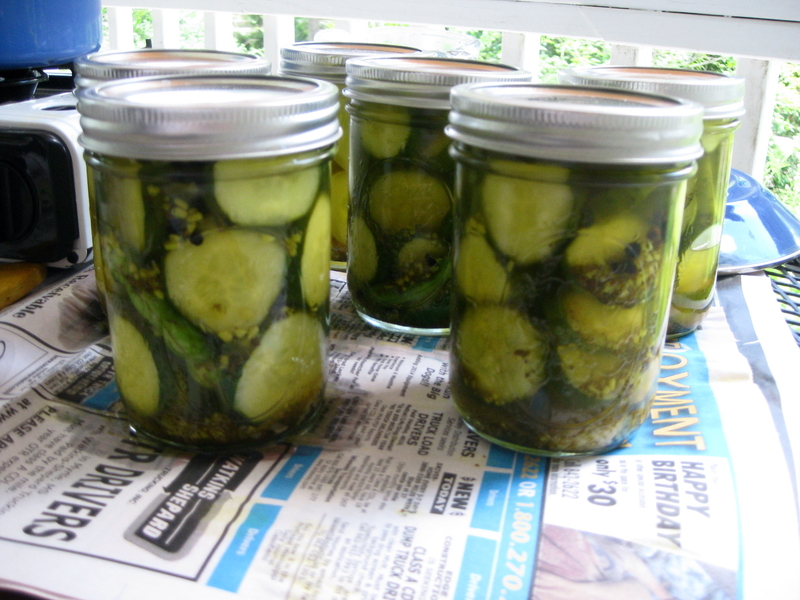 When the jars are cool enough to handle, tighten the lids, take them inside, rinse off and dry. Leave them on the counter for one day at room temperature. After that, store them in your refrigerator at least three days before serving. They’ll keep this way indefinitely.